About 90 students who are involved in 4-H or National FFA Organization from all across Georgia learned how to compete and judge poultry products during University of North Georgia's (UNG) third annual Poultry 101 program Feb. 3 on UNG’s Gainesville Campus. Part of the program include learning how to examine a live bird and proper handling techniques. Students from the fifth through 12th grades gathered around a table in a darkened room at the University of North Georgia (UNG) as junior Abigail Thompson shined a light on the large end of an egg to better see its yolk and air cell. "It's kind of like an ultrasound for an egg," said the 21-year-old business major from Habersham County. Thompson was teaching students about egg candling, including the way to judge and grade an egg. 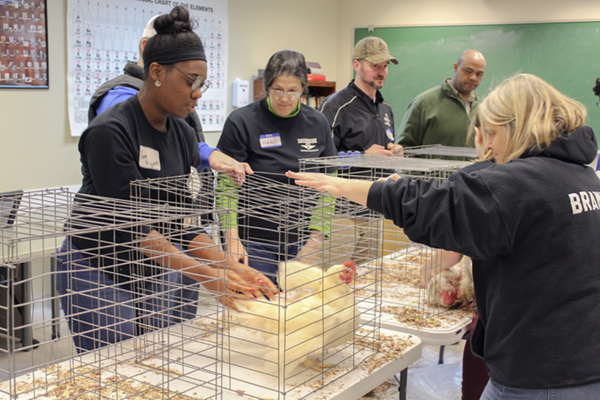 It was one of four sessions at UNG's third annual Poultry 101 program Feb. 3 on UNG’s Gainesville Campus. 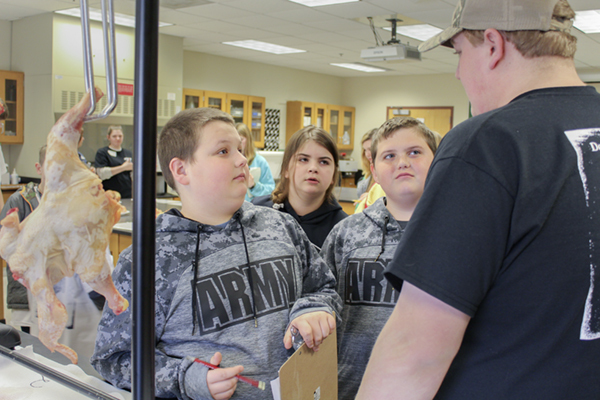 About 90 students who are involved in 4-H or National FFA Organization from all across Georgia learned how to compete and judge poultry products during the daylong event at UNG. 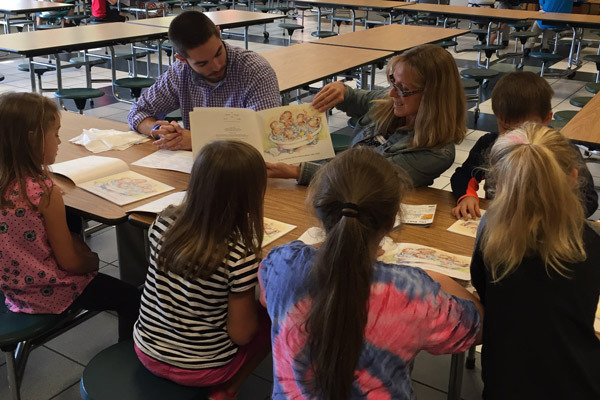 Nearly a dozen UNG students conducted the program, which is funded through a grant from the U.S. Poultry Foundation. 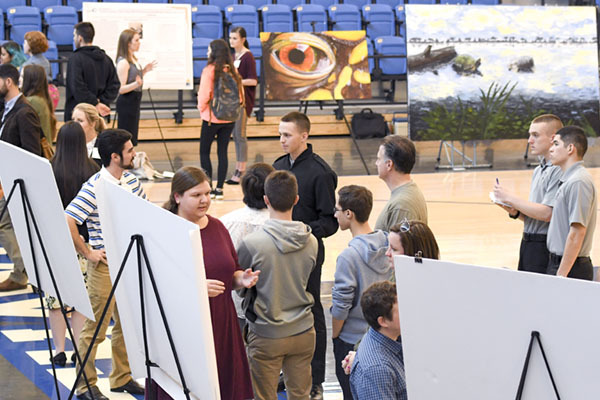 "We give students a crash course on things to judge and look for as well as how to prepare for these competitions," said Linda Purvis, a lecturer of biology at UNG. Purvis, who has taught at UNG since 2008, explained some students who are interested in agricultural products such as chicken, beef, eggs, and livestock do not have access to the items for hands-on training. That is where UNG and its poultry science and biology students fill the gap. "The students are looking at pictures on the computer or in a book," Purvis said. "We wanted to offer them the resources and put their hands on the live products. This way they have a tool to learn where it's more real." Students ranging in age from 9 to 16 learned how to compete and judge poultry products during University of North Georgia's (UNG) third annual Poultry 101 program Feb. 3 on UNG’s Gainesville Campus. Part of the program include learning how to examine a live bird and proper handling techniques. Thompson said the students responded well in the candling class, especially when a chicken from the live animal session laid an egg. "Everyone got to see an extremely fresh egg," she said. "They were holding it, saying 'Oh my goodness, it's still warm.'" The students, who ranged in age from 9 to 16, were not the only ones benefiting from Poultry 101. UNG students who help with the event gain valuable leadership skills and communication skills as they share and lead during the day, Purvis said. "Some of the current UNG students who helped lead in the event also compete on UNG’s Collegiate Poultry Judging team, so it is also good practice for them as well," she said. UNG also uses the program to raise awareness about its poultry science and biology departments. "A lot of advisors who bring students say they weren't aware of the programs at UNG," Purvis said. "We are the only school in the University System of Georgia that offers an associate degree with a focus in poultry science. And some jobs only require that." UNG’s associate of science degree has focus options in three agriculture-related areas in the biology department. They are agriculture, avian biology and poultry science. For students who wish to earn a bachelor's degree, a couple of options are available. "About 50 percent of our students will stay and get a bachelor's degree in biology and 50 percent will go to UGA because they want a bachelor's degree in poultry science or avian biology," Purvis said. "And some students will graduate with their associate degree and go directly into the workforce." Students attending the Poultry 101 program hear about these options and other UNG offerings. "They hear from our current students," Purvis said. "They tell them about the job opportunities in the area for students with interests in poultry and agriculture." Thompson said some students wanted to spend more time at the sessions, but UNG students kept the programs moving forward. "I think everybody got a quality education," Thompson said. For more information about the associate degree program, visit UNG's Department of Biology's website.